Was Msgr. Bugnini a Mason? 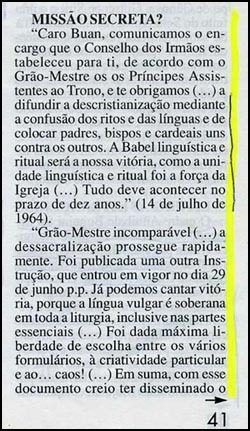 In June of 1992, 30 Dias magazine featured an article on the influence of Freemasonry in the Liturgical Reform of Paul VI. The magazine tries to save John XXIII and Paul VI from responsibility for the damage caused by the reform by putting the blame on Msgr. Annibale Bugnini. The main evidence against Bugnini consists of two letters that allegedly were found by a spy. We reproduce the contents of those letters as well as additional information given by the magazine. 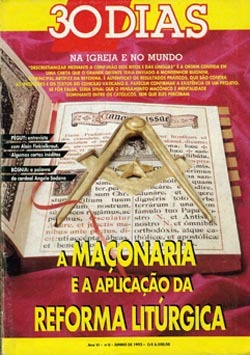 At right, the cover of 30 Dias, whose headline reads: "Freemasonry and the Application of the Liturgical Reform" and photocopies of the Portuguese text; below, our translation of the part highlighted in yellow. "Incomparable Grand Master ... The de-sacralization is rapidly taking place. Another Instruction was published, which took effect on June 29. We can already sing victory, because the vulgar language is sovereign in the whole liturgy, including the essential parts ... The greatest liberty was given to choose between the various formularies, to individual creativity, and to ... chaos! .... In short, with this document I believe to have spread the principle of maximum licentiousness, in accordance with your wishes. "I fought hard against my enemies from the Congregation for the Rites, and I had to use all my astuteness so that the Pope would approve it. By luck, we found the support of friends and brothers in Universa Laus [International Association for the Study of Liturgical Music], who are faithful. I thank you for the funds sent and am waiting to see you soon. I embrace you, Your Brother Buan" (June 2, 1967). These are excerpts from two letters. The first would have been sent to Msgr. Annibale Bugnini (code name Buan) from the Grand Master of Masonry. The second would be the response of the liturgist to the leader of the Lodges, communicating the accomplishment of the mission well before the fixed time. These documents - gravely defamatory to Bugnini, who always denied having maintained contacts with Masonry - are they true or false? It is impossible to say, given that they are typewritten and photocopied letters provided by a mysterious "spy" who would have delivered them to some Bishop and Cardinal friends, among them the Archbishop of Genoa, Giuseppe Siri, and the Prefect of the Apostolic Seal, Dino Staffa. If they are authentic, they reveal the existence of a "plan" to destroy Catholic doctrine and liturgy from within. They can also be falsifications produced by someone interested in creating rival "factions" in the Curia. The text of the letters, in fact, is very direct and unrefined. In any case, the letters exist and the results of the reforms of Bugnini are in full accord with the fixed objectives.